Let’s look at some not-so trendy trends that will never go out of style for your wedding reception no matter what year it is. Before Christmas, Jimmy Fallon and Justin Timberlake appeared on Saturday Night Live. The episode set a record for the most DVR views in history. It was estimated that the episode earned over 4 million more viewers than the normal SNL viewer fan base. What were the viewers expecting? Another comedic duo, Key and Peele, have some amazingly funny skits that people watch online and share with everyone. I know I do. A quick search of Key and Peele’s Substitute Teacher will reveal nearly 43 million views. Laughter will connect with people far more than any other emotional plea. By using elements of humor within your wedding reception and allowing opportunities to be funny and whimsical, you will keep your guests engaged. Some spots to add laughter: Personalized Grand Entrance, Your Love Story, Thank You speeches, Toasts, the Garter Removal and Toss, and many others. Add humor more than anything else and you will never live that party down. But what I really mean is that anytime you can bring your quirkiness, you will maintain your guests’ attention because you are sharing YOU, the one person they came to see. No matter what DJs and MCs think sometimes, your guests did not come to see the DJ. They came to see you. The worst wedding receptions are the boring wedding receptions. What makes them boring? Inadequate planning. When care is not given to the details of what is happening and when it happens, the wedding receptions lacks flow and no one has control. This will lead to downtime with no transitions. Guests will start wondering what’s next and when. If they feel no one is running the show, they will leave. The second worst thing that can happen to a wedding reception is over planning the details, meaning when you pack the timeline with every activity you can possibly think of, the guests will get overwhelmed. Too much is too much. Do not try to do every cute thing you find on Pinterest or attempt every different variation of common traditions. When you throw everything in that is different, especially if you do not have the vendors to pull it off, you end up with several lackluster events thrown together. Stick to some key elements. Vary a few of the traditions people come to expect at a reception. It makes it more unique to the overall scheme. Keep the timeline fun by mixing in one or two activities at a time in between open dancing. The key here is to think transitions. How will one tradition lead to another? Does it fit before, during, or after a session of open dancing? Here’s an example. When do you cut the cake? Do you cut it after the grand entrance? After dinner? Or after the first session of open dancing and lead into formal toasts? As a Wedding Entertainment Director® with 15+ years of wedding experience, I have seen the cake cutting done in all three scenarios. The placement of the cake cutting, along with other traditions, is sometimes determined by regional trends, venue, weather, etc. The placement in the timeline depends on several factors, but most importantly, what will happen before and after? Always ask WHY? Why are you choosing to do one tradition over another? Why are you picturing it done a certain way? Are you open to thinking different about the timeline of the wedding? With so much to think about in regards to your wedding reception, use the KISS method. Keep It Simple Superstar. 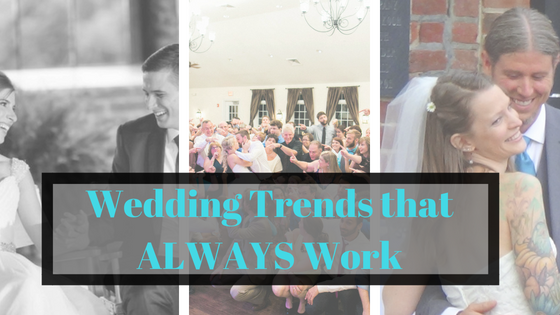 By definition, trends will come and go, but the memories of your wedding reception will remain. Take care to reflect on a few items that will make a big impact on how much fun you and your guests will have. Take the time to laugh during the wedding reception. Show your quirky personality. Spend time on your timeline thinking transitions and focused on building energy. Want proof? After reading the first draft of this article, my wife said the thought of having to plan all these details makes her physically ill. If having to come up with ways to show your personality, add humor, and explore transitions makes you feel overwhelmed, then I’m here to help. Contact Me TODAY and let’s set an appointment to discuss your wedding and all the details. Let’s make your wedding legendary!